Gold isn’t just back—Central Banks are on a buying spree like it’s WWII, and the biggest names in mining say we’re running out of physical gold. China and Russia are staking enormously on the precious yellow metal. By the end of 2018, Central Banks had bought up 74% more gold than the year before—and they’re still going strong. Russia is hedging against the dollar heavily. China, too. The World Gold Council says it hasn’t seen anything like this since 1967. It’s a combination of global events that could send gold prices soaring abruptly. All the biggest names in gold agree one thing: We’re running out of physical gold. Ian Telfer, CEO of Goldcorp, the biggest mining company in the world, says “we’re right at peak gold”. Franco-Nevada chairman Pierre Lassonde says the coming years will see a significant dip in gold production. And Seabridge Gold chairman Rudy Frink says gold reserves are shrinking noticeably. These fears are real. Discoveries in the past decade have paled in comparison to earlier times. When a little-known company suddenly manages to do the impossible and secure a license for one of the biggest gold and copper mines in the world, the finance world sits up and takes note. Now watch what’s happening in Romania, one of the richest gold venues in Europe. But because it’s home to legendary gold and copper resources that the government hasn’t let anyone touch. As one little-known company just became the first non-state-owned entity to receive a ratified mining license to get at what could become one of the biggest gold discoveries of the century. The little-known company is a mining tech genius called Euro Sun Mining Inc. (TSX:ESM, OTCPK:CPNFF), and it’s done what no one else could do. Using cutting-edge exploration and production techniques such as drone surveying and 3D geo-mapping, the company is aiming to dig up some $13 billion in gold and copper reserves. And this year, the massive resources near the Ro?ia Montana mines could be resurrected at exactly the same time that the world is running out of gold, and as gold is staging its biggest comeback ever. Where investors are zeroing in on a clean-tech shale-style revolution for Gold. This is Gold 2.0, and it’s all about clean tech, zero cyanide, and getting more gold for every exploration buck. Euro Sun isn’t only sitting on massive acreage in one of Europe’s most pre-eminent venues; but it’s also right next door to another hugely profitable mining estate in Europe. And better yet—we’re already running out of gold. Euro Sun Mining currently has a market cap of $40 million—a ridiculously low valuation for a company that just made an unprecedented jump in Europe’s second-largest gold mine, and one of the biggest in the world. Compare it to Timok—a very similar asset located in neighboring Serbia (that recently sold for $1.4 billion). It’s interesting to note that a Chinese firm recently bid $1.4 billion for Timok. That would make Rovina worth 90X more. A preliminary economic assessment estimated Euro Sun Mining’s average gold production of 196,000 ounces and 49.4 million pounds of copper each year over a 19-year lifetime. This implies that Rovina and, consequently, Euro Sun Mining, should be valued at no less than $3 billion. To put a finer point on things, that would make Rovina worth 180X more than its current value. The sizeable valuation disparity can almost entirely be chalked up to the constant comparisons with Gabriel Resources and Ro?ia Montana. Yet, to associate Euro Sun Mining with Gabriel Resources is unequivocally incorrect and absolutely misses the point. 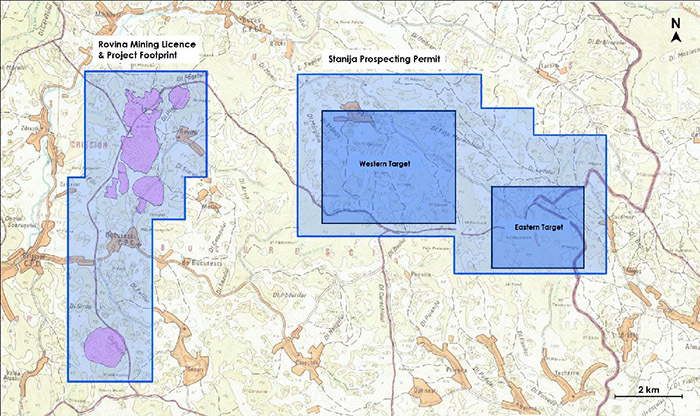 None of the many issues that have plagued Gabriel Resources apply to Euro Sun Mining. The company’s clean technologies have a much smaller environmental footprint—something that has endeared it to the government as evidenced by the mining license ratification process. Euro Sun Mining is well in the process of getting all the necessary permits, while Gabriel Resources is basically doomed. It’s important for investors to bear in mind that the company will re-rate materially higher when the mining license ratification is complete. Since 2011, gold traders have endured a torrid period amid one of the longest economic expansions in history. Low levels of financial market stress, asset purchases by global banks on a massive scale and extreme bullishness in equity markets led to a cooling off for gold stocks. We’ve just witnessed a shift from extreme optimism to deep pessimism. Trade wars, Brexit, bloody political upheaval in Venezuela and countless other global events have caused tectonic cracks in the global economy. The U.S. is not immune, either. Growth was only 2.6% in the fourth quarter of 2018—down from 3.4 percent in the previous quarter. Suddenly, the Fed has changed its tune, canceling interest rate hikes and expressing concern about slowing growth. In China, the situation is even worse. The economy is growing at its slowest pace in three decades. And China’s biggest trading partner, the European Union, has just cut its near-term growth projections by an astounding 40 percent. The EU economy is expected to grow at only 1.3 percent. Everywhere you look, signs that a global recession looms large abound, with the IMF recently cutting its 2019 outlook. 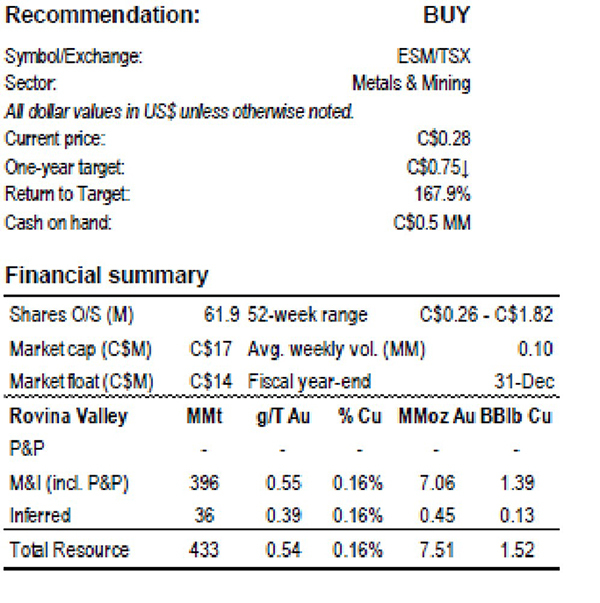 Undervalued junior mining stocks like Euro Sun Mining Inc.(TSX:ESM, OTCPK:CPNFF) offer the best chance for solid returns as investors turn to gold to hedge their bets—especially when they’re suddenly sitting on one of the most alluring gold mines in the world. 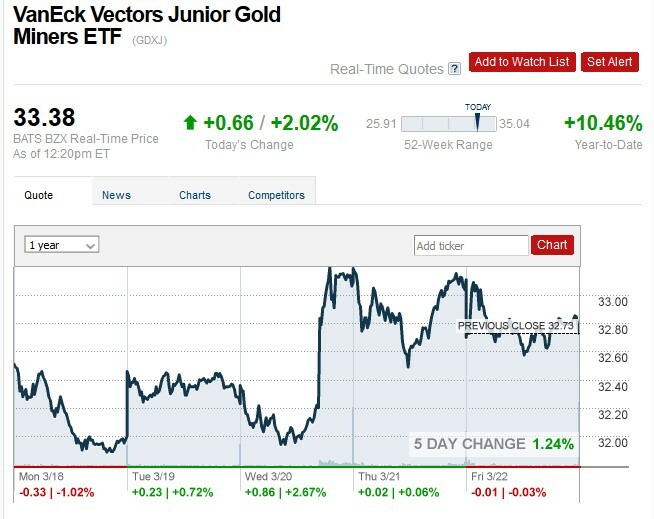 Even a 1% move in gold can send junior miners soaring 10% or more. With analysts already putting a price target of 80% higher on Euro Sun, imagine what even a small jump in gold prices could do? Euro Sun Mining is developing a world-class gold and copper mine that would put much bigger companies to shame. The company now has 100 percent ownership for roughly 400 million tons of ore in three discreet bodies consisting of about 7.1 million ounces of gold and a billion and a half pounds of copper working out to about 10.1 million ounces of gold equivalent. At a current gold price of $1320 per ounce, that’s more than $13.3 billion in potential revenue… and that for a company that’s currently valued at 30 million. And it gets even better. Extraction costs at the Rovina Valley Project are much lower than that of neighboring mining districts. 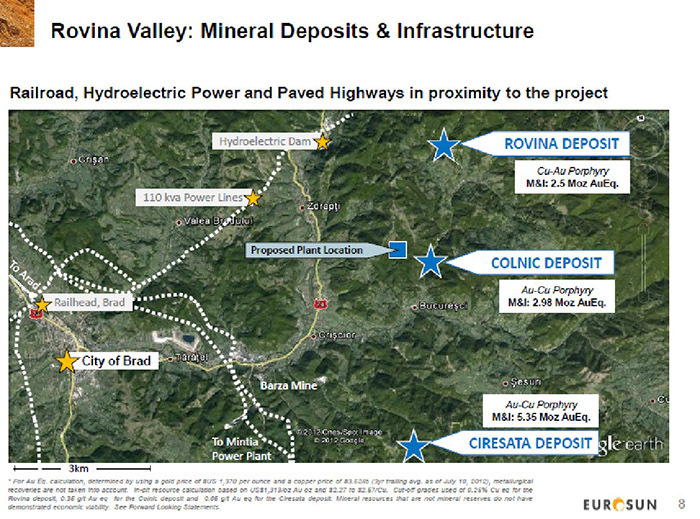 The Rovina Valley mine is frequently compared to Timok, a legendary mining district in Serbia—yet it is much bigger and provides superior mining economics. Rovina Valley not only contains much more extensive gold and copper reserves, they are also cheaper to mine. In November, the country’s National Agency for Mineral Resources (NAMR) officially endorsed the project and initiated the ratification process for the mining license. This is a short process that can be completed in a few months. That’s why a $40-million market cap company is starting to look a lot like a $3 billion company—and analysts seem to agree. The Rovina Valley Project (RVP) is located in prime mining estate. The plant location is about 3km away from a small town of 13,000 people. The town was home to a large mine for 80 years, and has a well-developed infrastructure network of rail, power, water-- they literally have it all. All other natural resource sectors have had to move forward with revolutionary new technology—to enhance recovery and to spare the environment. and Euro Sun is proving that in the ancient tunnels of Romania. Not only is it safe and environmentally friendly; but it’s also a boon to gold recovery. Euro Sun Mining (TSX:ESM, OTCPK:CPNFF) has put a lot of money into its research labs. It’s tried dozens of different chemicals and processes; and now it’s discovered the secret that makes those types of yields possible. The company is now able to extract 20 percent extra gold at zero extra cost. The process is “dry stacking”, which virtually eliminates contamination though seepage of groundwater when gold is separated from the hard rock. The concentrate was 9 or 10 percent, previously--and now its 22 percent, with about 100 grams of gold. In other words, the kind of grades that smelters would kill for. That makes the term undervaluation itself undervalued. Euro Sun Mining is the only government-endorsed private mining firm operating in Romania—thanks to its dedication to using clean mining technologies. The company has already embarked on an Environmental and Social Impact Assessment (ESIA) and continue its work on a feasibility study on the Rovina Valley project. Romania has an incredibly rich mining culture, which means that the government is keen to get everything restarted—but it’s got to be clean. Euro Sun Mining is devoted to using the latest technology with no environmental risks. And that speaks to ESG, which is all about environmentally and socially responsible investments. Euro Sun Mining (TSX:ESM, OTCPK:CPNFF) represents a highly asymmetrical risk/reward with little downside but very high upside. The shares shot up 50 percent when the company received a ratified mining license by the Romanian Government in November, and now it’s hoping to get production underway within 12 to 18 months. For the first non-state owned company to be issues a mining permit since 2003, and the first company to be able to cleanly cut the vampires out of this Transylvanian gold, this is a discovery on multiple levels. It’s got serious legs that are running at breakneck speed. First Majestic Silver (TSX:FR): There’s a lot of bullishness around this stock, with earnings growth expected to be high over the next 3-5 years. The optimism is absolutely justified as this Canadian mining company has been operating in Mexico for nearly a decade and has over $770 million in assets including 5 of the most promising locations in the country. Apart from its strong resource base in a proven jurisdiction, First Majestic Silver could see its share price go up significantly in the next 2 years, as a majority of world-renowned economists are now expecting a recession before the end of 2020. The agreement is a major step forward for the Agua Rica region, and all of the miners working on it. 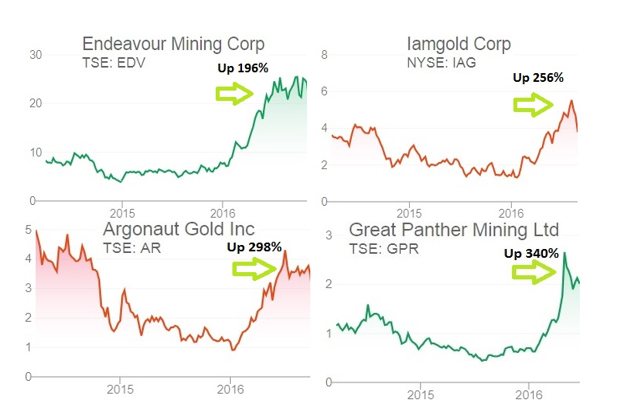 This Canadian mid-cap miner has assets in Europe and Brazil and has managed to cut cost per ounce significantly in recent years. Though its share price isn’t as high as it once was, Eldorado is well positioned to make significant advancements in the near-term.